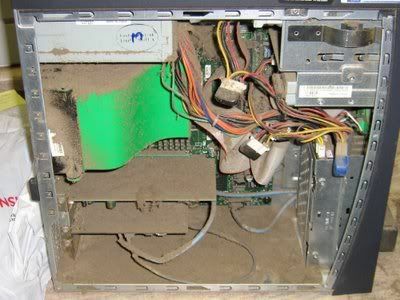 The DurbanGeek ~ IT Solutions: Dust build up in Desktops & laptops - a little maintenance! Dust build up in Desktops & laptops - a little maintenance! Every desktop or laptop collects dust, the trouble is we often forget it's there or even bother to look. Because computers need fans to keep them cool the down side of this is that dust gets sucked in- over a short time this build-up of dust can fill a desktop tower very easily to such levels you can hold it in your hand. At any level dust is not good news for computers as there is electric passing through the system all the time this could start a small fire if left for too long without cleaning. 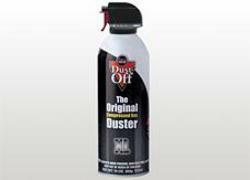 The worst thing about dust is its very bad for your health unknowingly breathing in dust fumes from your laptop or tower as well as building up static electric so you could get a nasty jolt one day. your local hardware store, or used compressed air from a compressor (as long as its dry and not too strong). Do not use your vacuum inside the tower as there are many small connections which could easily be damaged or come loose by the suction, not only that vacuum cleaners tend to build up static electricity which can fry the components in your tower. One of the many reasons a computer will slow down is due to dust and the lack of air flow as the pc / laptop becomes hot very quickly - if it gets too hot the desktop or laptop may not start at all as a safety switch kicks in. We believe that you should at least get your laptop or desktop cleaned out annually if you are in an office environment or more periodically in a dusty environment. If you would prefer to get a professional to do this for you contact us and we will give you a quote. Not only do we clean them , we will replace the thermal paste between the heat sinks and CPU and GPU . We will inspect for tired fans - check fan speeds, loose connectors etc and we will tidy up the cabling.